Outside Ballymote Castle (Sligo, Ireland). Inside Ballymote Castle (Sligo, Ireland). Ballymote Castle is a large enclosure castle, the most symmetrical of all the Irish “keepless” castles. It has many similarities with Beaumaris Castle, in Anglesey, Wales, built by King Edward I of England. The interior measures about 30 square metres (320 sq ft). There are three-quarter round towers at all four corners and also in the middle of the east and west walls. A postern gate, which was planned for the centre of the south wall, was never completed, probably because of the events of 1317, when the castle was lost to the O’Connors. A small square tower had protected this gate. 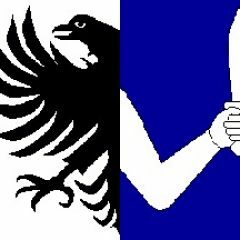 The Red Earl is also credited with building the ancient road from Boyle, County Roscommon to Collooney, known as Bóthar an Corran and as the Red Earls Road. The castle changed hands many time.Captured by O’Connor Sligo in 1317, it was taken by the Mac Diarmada, during the of local battles during 1347. By 1381 the McDonaghs were in possession. It appears to have been “abandoned” more or less from 1317 to 1584, which is read as not being Garrisoned as a military base, but was probably occupied by someone (given the times and lack of building materials and the Weather in Ireland). Next Owned by Tadhg MacDermot, one of the last of the Kings of Moylurg in 1561, it appears to have passed to the O’Connor Sligo by 1571, at which time he surrendered the castle and had it regranted to him by James I (19 June 1566- 24 March 1603) of England, from the union of the Scottish and English crowns on 24 March 1603 until his death 27 March 1625. 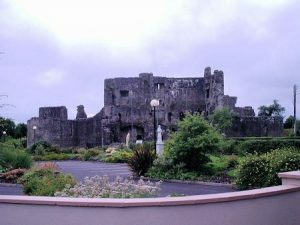 In 1577, the castle fell into English hands for a short period and then more permanently in 1584, when it was taken by the Governor of Connacht Richard Bingham. In 1584 the castle was taken by the notorious governor of Connaught, Richard Bingham, but in 1598 it was in the possession of the MacDonaghs who sold it to Red Hugh O’Donnell (one source says he bought it for £400 and 300 cows). It was from here that Red Hugh O’Donnell, Tir Connail Chieftain, marched to disastrous Irish defeat at Kinsale , 1601, Red Hugh O’Donnell would later leave Ireland and travel to Spain to seek help. After nine months he was struck down by an illness and dies at the age of thirty. He is buried in Vallidolid in Spain. When the O’ Donnells surrendered it to the English in 1602, it was already in a bad state of repair. In 1633, the Taaffes owned it for a short time, but had to surrender it again to the English Parliamentary forces in 1652. 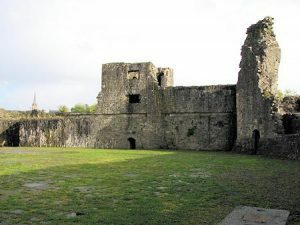 In the Williamite wars the castle was held by Captain Terence MacDonagh for King James II, but he had to surrender it to Lord Granard in the face of an artillery attack in 1690. Soon afterwards the fortifications were made harmless, the moat was filled up and the castle fell into ruins, now in modern times, the Office of Public Works preserves the Castle. Although there are now no traces of the interior domestic buildings, you can see inside the walls if you phone the Enterprise Centre, Grattan Street on 071-9183992 to get the key (for a small deposit).The Centre is open from Monday to Friday, from 9am to 5pm, and frequently (at restricted times) on weekends in the summer. You show yourself around. Ask for the information leaflet. It is thought that the famous manuscript, The Book of Ballymote, which is now in the Royal Irish Academy, Dublin, was compiled here in about 1400AD. It contains, on 251 vellum pages, chronological, genealogical and historical pieces in prose and verse relating to saints, remarkable Irishmen and important families, among other things, and was mainly the work of Solomon O’Droma and Manus O Duigenann. Paddy Killoran was born in Ballymote into a musical family. His style, typical of Sligo fiddling style, was more brisk in tempo than most, and with less ornamentation, variation, and modulation in volume than Michael Coleman’s playing. He emigrated to American in 1925 and made a living as a musician. During the 1930s there were several dozen dance halls in New York, one of which, The Pride of Erin, gave its name to his band, The Pride of Erin Orchestra. This band was for many years the most popular Irish group in the city, and even toured Ireland once for three months. The Orchestra also performed on WBBC radio in Brooklyn for several years. Like Coleman, his recordings had a huge influence on fiddle playing in the 20th century.